A Lake District fell path has been restored using an ancient fix with sheep's wool. Volunteers restored part of the path at Angle Tarn in Langdale, which included burying the fleece in boggy land. The group used wheelbarrows to transport the fleeces and equipment up a 1,500ft (450m) ascent. 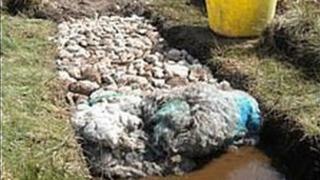 Rob Clark, from Fix the Fells, said: "Sheep fleeces have been used for hundreds, if not thousands of years, to form a base on areas of bog and peat." He added: "Like many of our paths, this was rough and boggy. When grassy sward has been trampled by years of walking boots, it dies off, leaving exposed peaty soil, which erodes and turns into bog. "Once buried, it hardly ever rots and will last the lifetime of a path. For surfacing, we use pinnel, a glacial subsoil dug from 'borrow' pits nearby."